Nearly 60 years ago, GE gave a company called Alstom the license to manufacture a revolutionary technology – the gas turbine – in Alstom's burgeoning factory in Belfort, France. Alstom, which GE would acquire more than 50 years later, agreed to manufacture the turbine, and it wasn't long before the first gas turbine rolled out of the factory. The turbine was shipped and installed in Algeria, a newly-independent nation that needed power. This story was the beginning of GE's long-standing and strong relationship with Algeria. Fast forward to today – GE Aviation's jet engines power approximately 70% of domestic aircraft; GE Healthcare's advanced solutions are deployed in up to 3,000 care facilities across the country; and GE Power's technology supports nearly 70% of the electricity produced in Algeria. A great deal of that electricity came from our 2013 agreements with Sonelgaz, and it was one of my proudest moments leading the GE Power team (the photo left/above shows our team that year). Now, we're making history again. Yesterday, GE and Sonelgaz announced a landmark deal that will directly benefit Algeria's infrastructure, economy and way of life. The deal, the largest Power Services deal in GE's history, includes long-term operations and maintenance services at 10 power plants that will generate 11 gigawatts of power across the nation, which is equivalent to the power generated by about 20 of our largest 9HA gas turbines. That's a huge amount of power. In addition, we're providing 68 Advanced Gas Path (AGP) technology upgrades which will deliver an additional 420 MW of power, which is equivalent to powering nearly 1.5 million average households. All these capabilities will help save up to $2 billion in gas costs, help Sonelgaz run their operations more efficiently and secure Algeria's energy future. Critical to this milestone was the dedication and hard work of our local team in Algeria, who has built a long-standing and strong relationship with Sonelgaz, that's based on mutual trust and commitment to value creation. Recently, Algeria's industrial consumption of electricity has grown by more than 3% and residential consumption by 9%. Like many countries, Algeria faces challenges, including oil and gas market fluctuations, a slowdown in new capital investment, and the increasing volatility of electricity grids as renewable energy is balanced with traditional baseload power generation. But Algeria is well positioned to convert these challenges into opportunities. This is because Sonelgaz is committed to harnessing the benefits of digital to transform the power its creating and the energy ecosystem it operates in by leveraging GE's Fleet360™ total plant solutions portfolio with solutions like AGP and GE Digital's Asset Performance Management and Operations Optimization software applications to monitor and analyze data drawn from thousands of sensors to eliminate unplanned downtime and improve power plant productivity. 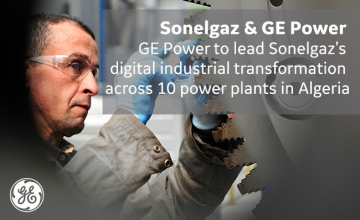 GE Power is excited to partner with Sonelgaz as it begins its digital industrial transformation journey and to support a growing nation that's kept us at the forefront of technology and innovation for the better part of a century. And it all started with a gas turbine.